CAPTION: The American Junior Gelbvieh Association began their Black and Gold Classic at Chillicothe's Litton Ag Campus on Sunday with the presentation of the national show's opening ceremonies. The Classic runs through Saturday. Multiple cattle owners and show-persons took advantage of the services of the Litton Ag Campus and washed their bovines upon arrival to the American Gelbvieh Junior Association's Black and Gold Classic being held from July 1-7 in Chillicothe. Sunday (July 1) was setup day and opening ceremonies. Contests and leadership activities are July 2-4. 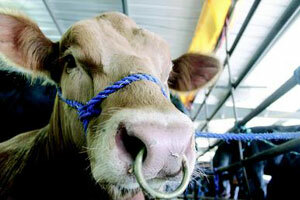 The National Showmanship Contest and National Balancer and Steer Show are planned for Thursday, July 5. On Friday, July 6, participants will take part in the AGJA National Gelbvieh Shows, followed by an awards banquet at Good Time Charlie's. Cleanup is Saturday, July 7.